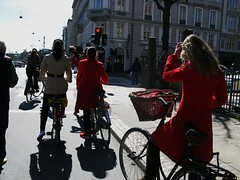 An average Copenhagener on an average bike in the gorgeous spring sunshine. As we've mentioned before, on average 37% of the population ride their bikes each day but on sunny spring and summer days that number rises over 50%. A whole lot of red at the red light. A fine example of how a wicker bike basket is used while off the bike. A means of carrying your shopping or as a replacement for a purse. The basket above has metal hooks that let it hang on the handlebars, making it easy to lift off and carry into shops or, in this case, down to the canals to enjoy the sun. I like your site. 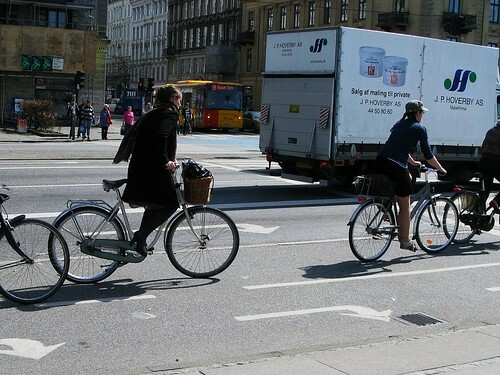 I stayed in Copenhagen for a couple of weeks a few years ago and was amazed by the number of people on bikes. It made the city seem slightly Utopian. If I'm honest I was also impressed by the number of gorgeous girls cycling. It made them seem so... healthy. I'm a bike chic, but high heel-less, gotta get me some! I would love to live there and ride my bike everyday. I'm kinda the anti-driver. I like Your side. Very intrigued me taxis' boots (trunk) for bicycles. This is good idea! We do not have this in the Poland. Hy, i was looking at sites and i founnd yours! I never visited Copenhagen and i know just a little bit about city. Anyway what i wanted to say that great great site, if we all would use just a few months of the year our bikes we would do a great contribution and of course in "Style" as we can see on your site - to the world to our air that we breath in. I am not an activist just an ordinary person but i think we individual have the power to make the world a little better for our kids. Great idea that basket, I might use it on the back of my motorcycle. great comments! y si, si, raquel... primavera! Copenhagen seems disgustingly chic and cycle-friendly. And that thing with the basket? 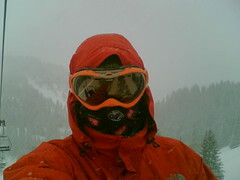 She couldnt have looked slicker if she tried!